Carefree power metal generally amounts to classic/unbeatable Keeper-era Helloween and early Sonata Arctica. It’s less fantasy, more tongue-and-cheek. Slightly on the poppy side, but doesn’t forsake heaviness. A shame that more bands don’t give it a run, Edguy probably being the last legitimate band to do so, but here comes Russia’s Estate, thick accents, playful presentation, and halfway-there songs in tow. Formed in 2012, the band has already shared the stage with the likes of Doro and Michael Schenker, but in turn, their Fantasia debut reflects a band still wrangling with maturity and proper songwriting cues. Natural stuff, really. 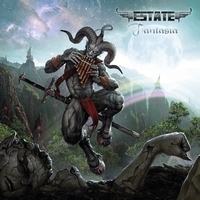 In terms of a proper reference point, Estate resembles modern day Sonata Arctica more than anything. A good chunk of the jams here are mid-tempo, verse-chorus-verse-chorus romps, with the occasional quirk and goofy happening, which again, is something SA is presently quite fond of. Some 80’s hair metal sleaze creeps in on some cuts, most notably, “You Are Not Alone” and the highly questionable “Absolutely True!” a song so convincingly performed in Poison/Warrant fashion, that DR had to double-check to make sure it wasn’t a cover. Regardless, there are a few able-bodied numbers here, like the joyous “Hero” and energetic “The War,” which is perhaps the pick of the litter here. Naturally, having to contend with Dmitry Efimov’s unorthodox delivery may be the biggest hurdle for would-be listeners of Estate. Since English is certainly not his first language, there is a fair degree of struggle with enunciation and word placement, but again, that comes with the territory with Russian metal bands. Beyond that, Fantasia is mostly respectable stuff, and since the band’s head is in the right place (minus “Absolutely True!”), therein lies the potential to establish themselves as a name in Russian metal.